My name is Natasha, Alexander Luo Funa. My family and I received treatment in Sun-good Traditonal Chinese Medicine. My diagnosis in Russia was gall-stone. I conducted the second diagnosis in Sun-good TCM and the result showed that the stone in my gall had became sand. My daughter was over weighted. The doctors here did acupuncture and message and prescribed some herbal tea for her. I stayed in Dalian for 2 weeks. During that time my daughter lost 11kg. I`d like to thank all the doctors and translators for their help. They are all experts of their own field. In August, 2013, Natasha from Amur-komsomolsk arrived at Sun-good TCM for treatment. she was 150kg at that time. After two weeks` treatment through acupuncture weight loss, her weight was 135kg. She lost about 15 kg weight, which made her very satisfied. Allah, female, 74, comes from Kamchatka Russia. Wait and knees pain for 8 years after injury. Eight years ago, lumbar vertebra and knee-joints fractured. After recovery, waist and knee-joints were rigid and movements were seriously limited. She couldn’t take care of herself and depended on wheelchair and crutch totally. 2. There is pressing pain on the sides of lumbar vertebra, especially after exercise. Anteflexion is 10°， rear protraction 5°， lateral curvature 0°. 4. There is serious pressing pain in bilateral knee-joints. 5. Bends and stretches are nearly impossible and pain aggravates significantly after exercise. 6. Right knee bending is 20°， left knee bending 30°. 2. Four fifth of chronic compression fracture in waist was coalescence. Articular surface of bilateral knee- joints was injured seriously and joint space ranged. Four fifth of chronic compression fracture in waist, osteoarthritis in bilateral knee-joints. 1) Remedy the dysfunction of facet joint of lumbar by releasing conglutination through small needle-knife therapy. After twice small needle-knife treatments assisted by external application of Chinese medicine, waist pain disappeared two weeks later. Lumbar scoliosis disappeared and physical movements were free with waist anteflexion 180°and rear protraction 45°. after receiving treatment in first hospital. In the second one, as there is no Russian translator, I couldn’t communicate with doctors. So I gave up, too. My translator and guide Misha advised me to go to Sun-good TCM Hospital. She promised me communication was not a problem there. After arriving at Sun-good in 2006, I was very surprised. There were Chinese girls here who could speak Russian. Doctors here took my pulse and gave me an accurate body check by advanced instruments. During talking, I learned that traditional Chinese medicine was different from western medicine. I suffered from lumbar disc herniation with 10.8mm at the beginning. I received 3-month treatment by massage, acupuncture and chinese herbal medicine. I had no idea which therapy was more important, but I knew that herbal medicine was natural and customized. Every one and a half year, I came to Sun-goodHospital. Apart from the diagnosis of feeling pulse, I also received MRI examination. In my last examination, the length of lumbar disc herniation was reduced to 4mm. It is unbelievable that I can recover so fast and well without a surgery. "One more step""Good, come on!" Natasha, a 7-year-old girl, is from Russia. Her family had a car accident 3 years ago and left alone. This accident damaged Natasha's spine nerve seriously. Ever since, this little had never stood up. "We'll try every means to make her stand up again. "said her uncle and aunt. For this purpose, this couple has been to almost every hospital in Russia and Europe. Sadly that didn't help little Natasha a lot. Last year, on the recommendation of their friends, they came to Dalian to seek help. The experts in Sun-good TCM Hospital proposed a comprehensive therapy characterized by massage, acupiont, physical therapy and transfusion after full examination and arranged professionals to care her. Twenty days later, Natasha's condition became better with more powerful leg muscles. She could sit up with support. 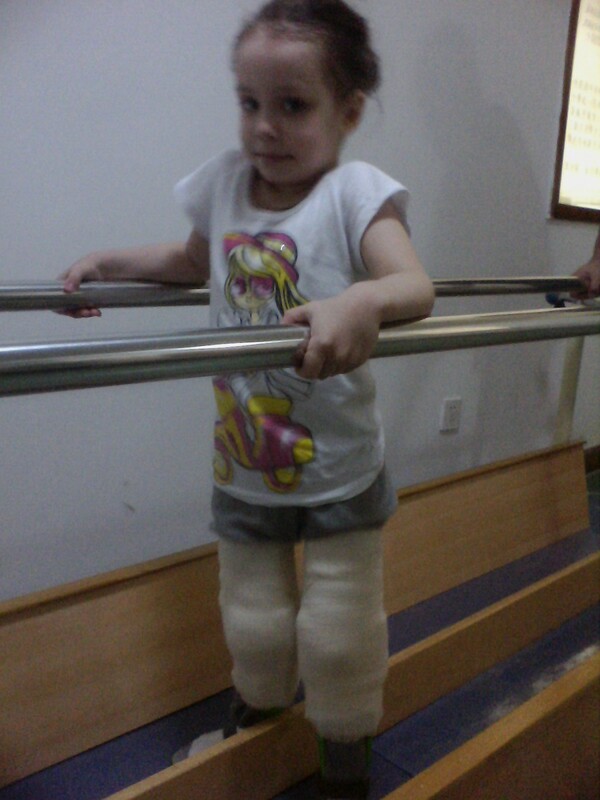 Through the second treatment this year, Natasha could not only sit up but stand up with the help of medical instrument. "The magical Chinese medicine sows sunshine in Natasha's life again. Her parents can rest in pace."